Procedure to fit the obtained uv-data with the Fourier Transform of the following functions (see Fig. ): a point, a circular Gaussian, an elliptical Gaussian, a circular disk, an elliptical disk, a circular or elliptical ring, an exponential brightness distribution, a distribution proportional to radius , and a distribution proportional to radius . 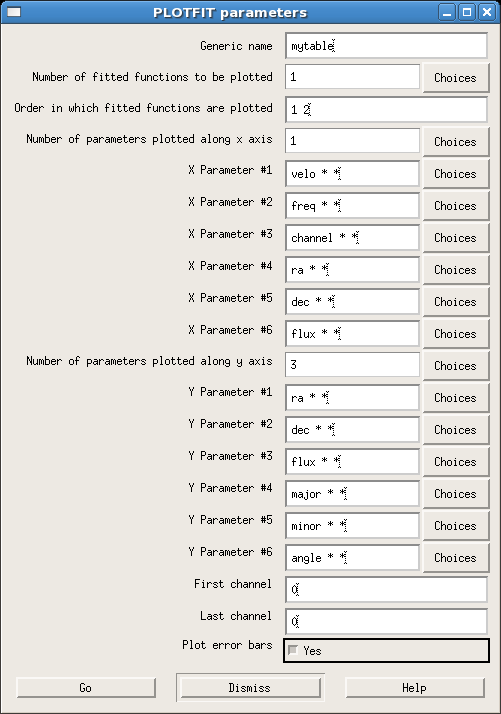 Some parameters can be fixed by defining them in the option Parameters. They are the offset R.A., offset Dec and flux for a point function, offset R.A., offset Dec, flux and diameter for c_gauss, offset R.A., offset Dec, flux, major and minor diameter and position angle for e_gauss, offset R.A., offset Dec, flux and diameter for c_disk, offset R.A., offset Dec, flux, major and minor diameter and position angle for e_disk, offset R.A., offset Dec, flux, inner diameter and outer diameter for a ring, offset R.A., offset Dec, flux and diameter for the functions called expo, power-2 and power-3. The fitted function can be subtracted in a residual table (of extension uvfit) that later can be plotted with UVSHOW (Sect. ). 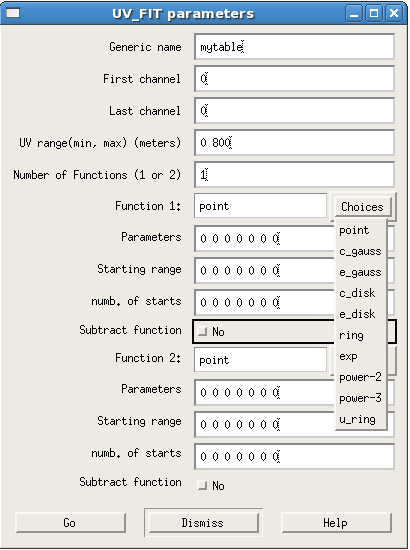 Figure: Left: UV_FIT parameters, to fit the UV-data with the Fourier Transform of simple functions. Right: PLOTFIT parameters, to plot the fitting results obtained with UVFIT.